Fig. 554. A Bob-Sled of Which Any Boy Might Be Proud. 1 - How to make a bobsled out of wood2 - Part 23 - Part 34 - Upholstering the Seat. There are two ways of building a bob-sled. One way is to knock together a pair of coasters out of any sort of material that happens to be at hand, and connect the pair with a plank or board, in the shortest time possible; the other way is to use the best material that you can get, and assemble this so as to produce the most substantial sled you know how to make, regardless of the time the work requires. The first method is all right for a rough-and-ready bob, but the latter method is the one to follow if you want a sled that will serve not only through the winter season of the current year but for years to come. In building the model shown in the photograph of Fig. 554, the author worked out every detail with strength and durability uppermost in mind, and if you will carefully follow the working-drawings and instructions your completed bob-sled will be something of which you can be mighty proud. The Material Required will not cost a great deal; possibly you have the right sort of stuff at hand for the greater part of the sled. The model in the illustration is upholstered, with a top covering of imitation leather. Upholstering is such an easy thing to do that I would advise you to upholster your bob-sled; however, you can use cheaper material than imitation leather. Oilcloth, burlap, or a strip of carpet will answer the purpose. Two boards 10 inches wide and 12 feet long, out of which to cut sled runners, crosspieces, seats and hand-rails; and a piece of 2-by-4 for connecting blocks, will be all of the lumber that you will need. 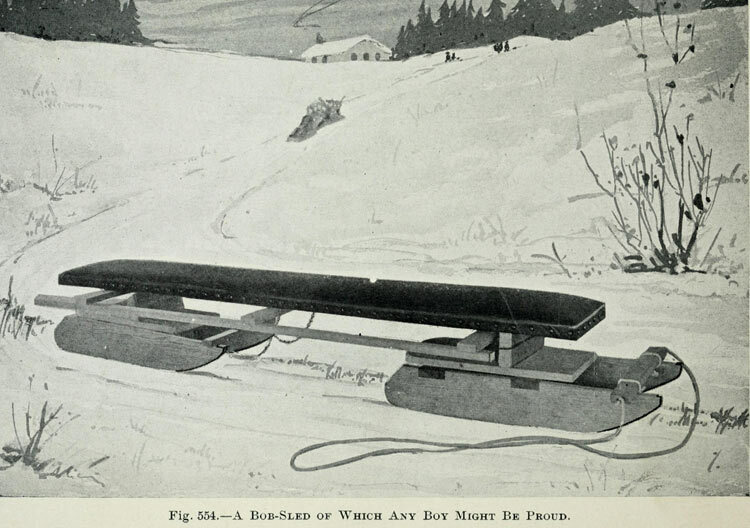 Then, in addition, you will have to have eight corner irons for bracing the sled runners, a %-inch carriage-bolt 7 inches long with which to pivot the bob-sled seat to the bow sled, a pair of 4-by-4-inch steel hinges for hinging the bob-sled seat to the stern sled, fourteen stove-bolts 1 inch long and eight 2 inches long, for bolting the hinges and hand-rails in position, %-inch and ij^-inch screws, ij^-inch and 2-inch common nails, four pieces of half-oval iron strips for runner shoes, a piece of iron jack-chain 2 feet long with which to check the bow of the rear sled, and four %-inch screw-eyes. For upholstering the bob-sled seat, you must have excelsior, covering material, and tacks. Figure 555 shows a detail of the completed sled, with one-half (the bow) drawn in section, and the other half (the stern) drawn in elevation. All parts are lettered on this detail, and correspondingly lettered on the smaller working details (Figs. 556 to 570), to make clear the assembling. The Sled Runners should be prepared first of all (A, Fig. 558). Figure 561 shows a pattern, with the ends ruled off into squares to simplify the laying out of the curved bow and stern. Take a cardboard box-cover, and make similar patterns for the bow and stern, ruling off the same number of squares, 1 inch square, then locating on the lines separating the squares points corresponding to points at which the curve intersects the lines on the pattern illustrated. With the points located, it will be an easy matter to connect them with a curved line. Locate the pair of notches in the top edge, for the connecting crosspieces B (Fig. 558), and carefully cut out the pattern. Splice two pieces of cardboard end to end if you cannot get a long enough piece of single length for the pattern. With a saw, cut out the ends, sawing to within about % incn of the line, then finish up to the line with a plane, and sandpaper. Cut the sides of the notches with a saw, and split out the wood between the cuts with a chisel.